We stopped in our tracks on the shoreline to watch two giant pelicans effortlessly soar over our heads and gracefully land in the lake. The Colorado sun had gotten high enough in the sky to feel its heat on our bare shoulders and bring beads of sweat from the morning’s run. A canoe with a fisherman slowly drifts by, casting spider webs of line toward hollows where the fish hide. The soft purring snorts and clicking hooves of horses carrying riders across the stony creek mix with a myriad of bird calls and insect noises that distinctly claim the late-summer soundscape as the day begins in the southwest Denver area. 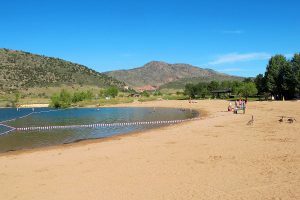 Snuggled against the shoulder of the hogback along the Front Range, Bear Creek Lake Park is an urban gem with a rural appeal. The park is run by the City of Lakewood, a southwest suburb of Denver. With more than 20 miles of trails and 2600 acres to explore, the park offers something for everyone. Start your day off with a brisk run or bike ride. 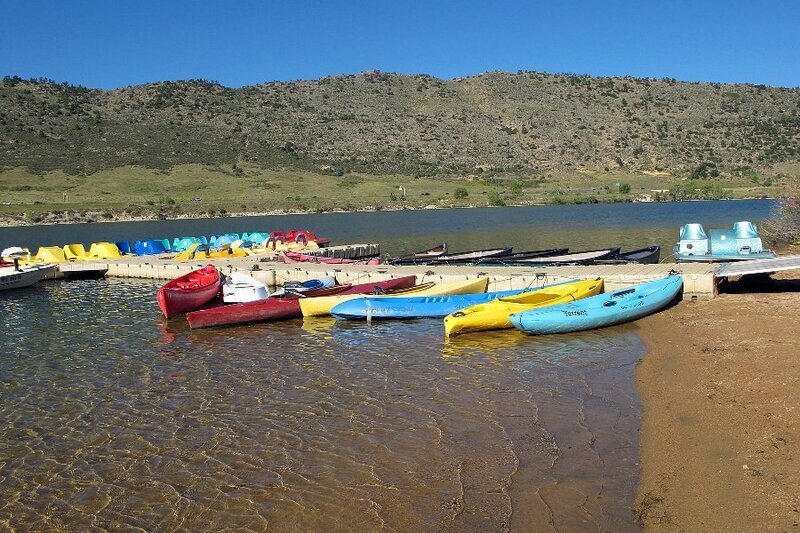 Later, try your hand at archery target practice, enjoy a western trail ride by horseback, fish in Bear Creek Reservoir or along the banks of Bear Creek, rent a paddleboat and tour Soda Lake, or just hang out on the swim beach to beat the summer heat. The park also offers waterskiing lessons, two golf courses, and many naturalist programs and activities to keep you busy. Abundant wildlife including deer, coyote, bob cats, bear, and birds call the park home and can often be observed in the park. The park has a critical function beyond serving as an open space park. Across the Front Range of Colorado, where the prairie meets the foothills, rivers and creeks flowing from the mountains have a long history of catastrophic flood events following heavy summer rainstorms. 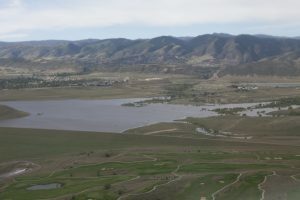 To try to control future flood waters and avoid repeat disasters, the US Corps of Engineers built the Bear Creek Dam as part of major flood control reservoirs along the flood-prone drainages in the Denver area (as well as Chatfield Reservoir, Cherry Creek Reservoir, and Strontia Springs Reservoir) in the late 1960s to mid 1970s. 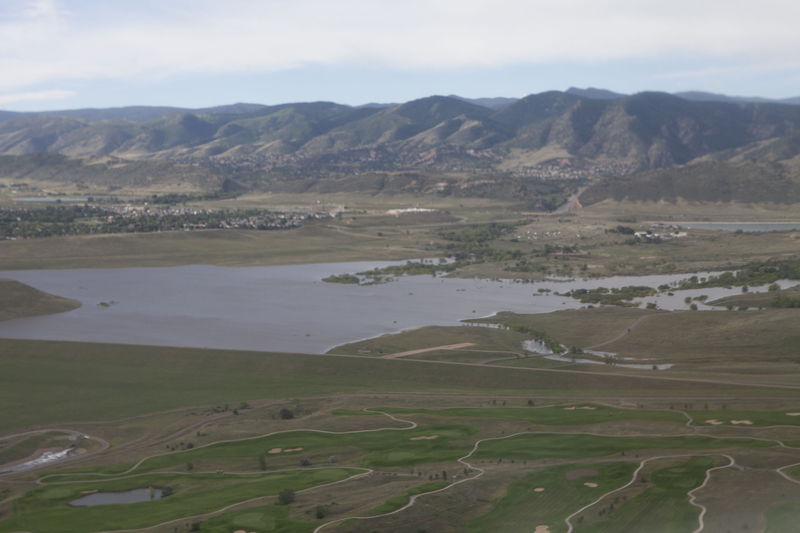 Recently, the Bear Creek Reservoir was put to the test in 2013 and again in 2015 when major flood events hit the Front Range – the park was flooded, but downstream residents were kept safe. Evidence of these floods are still visible in many areas of the park. Bear Creek Lake Park has an in-park campground that is RV friendly with electrical hook-ups and large camp sites. The Paintbrush Campground offers 47 level camp sites, 2 yurts, 3 cabins, shower and toilet facilities, water stations, and can accommodate groups up to 25 people. 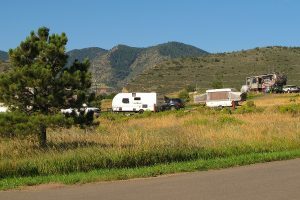 The campground is located within walking distance to the swim beach and small craft boat rental area, archery range, horse stables, and trails. The dry Colorado climate and spacious views lend to lots of daytime sunshine and beautiful sunsets for all to enjoy. With all the open space to explore within the park, it is hard to keep in mind that downtown Denver is a mere 30 minutes drive away, with all the amenities a thriving metropolitan city has to offer. The iconic outdoor concert venue, Red Rocks Amphitheater and Red Rocks park is only 5 miles from the park, and Bandimere Speedway is less than 4 miles away. Other attractions include Dinosaur Ridge where you can learn about the prehistoric dinosaurs that roamed the area when oceans covered the Denver Basin, numerous areas to hike, shopping and restaurants – all within a short drive. Bear Creek Lake Park is the perfect spot for anyone wanting to get away (but not THAT far away) from it all and explore the Denver area. For more information, check out Paintbrush Campground on Campground Reviews.